When Apple released its earnings report for the holiday quarter on Tuesday after market close, there were few real surprises. After all, the company had already warned shareholders that holiday sales hadn’t been as good as previously expected. And while that was in fact the case – overall sales declined by 4.5 percent compared to the same period of last year – there were still plenty of positives to take away from Apple’s latest results. First of all, the company reported the highest earnings per share in its history at $4.18, indicating that while it may have trouble keeping up the growth of recent years, Apple remains incredibly profitable. Secondly, the disappointing result in terms of sales can be traced back almost entirely to weaker-than-expected iPhone sales. Every other aspect of Apple’s business, that includes the previously struggling iPad and Mac categories, grew by a significant margin. According to yesterday’s earnings call, several factors contributed to the iPhone’s weakness last quarter: a strong dollar increased prices even further in many developing countries, lower carrier subsidies also make iPhones seem more expensive and Apple’s battery replacement program convinced many iPhone users to hold on to their device just a little longer. 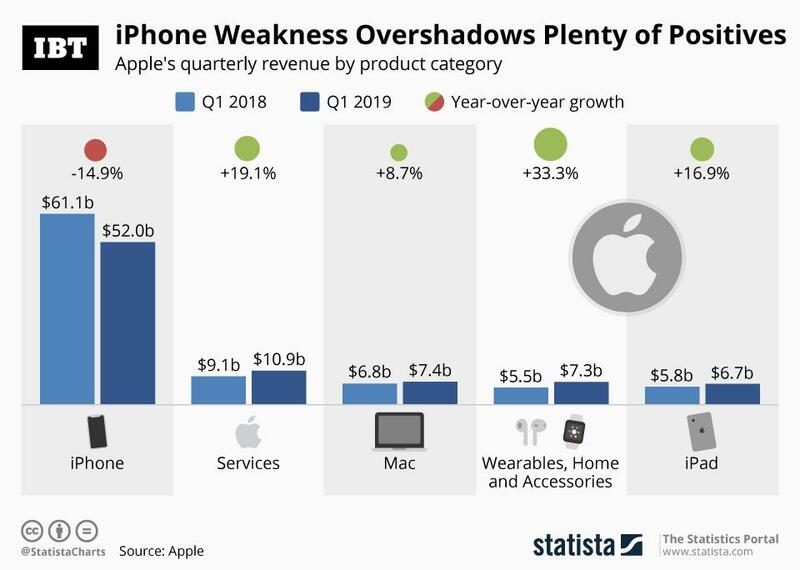 As the following chart illustrates, a great result from Apple’s “other products” segment, now renamed “wearables, home and accessories” and good to very good results from Mac, iPad and services weren’t enough to offset the weakness in iPhone sales. After all, the iPhone still accounts for more than 60 percent of Apple’s total revenue.